The Hashemite Kingdom of Jordan (to give it it's full name), was surprisingly a world apart from Egypt. I had somehow, in my ignorance, imagined the two countries would be very similar. I found it more reminiscent of its Middle Eastern neighbour Israel, (that’s right folks, I have a passport and I haven’t been afraid to use it – Michael Palin is only trottin' after me!). Upon arriving at the airport in Amman, the gentlemen you see gathered at arrivals in every airport around the world, car keys in one hand, placard in the other, were unlike any I had seen before- Prada shoes, Gucci sunglasses, cashmere sweaters, dangling keys to Beamers and Mercs. These men with their well slicked hair and well heeled loafers were an embodiment of a wealthy oil rich country. According to our guide, unlike Muslim Egypt, Jordan was more secular where about 40% of the population were Muslim, 40% Christian and 20% of no faith. 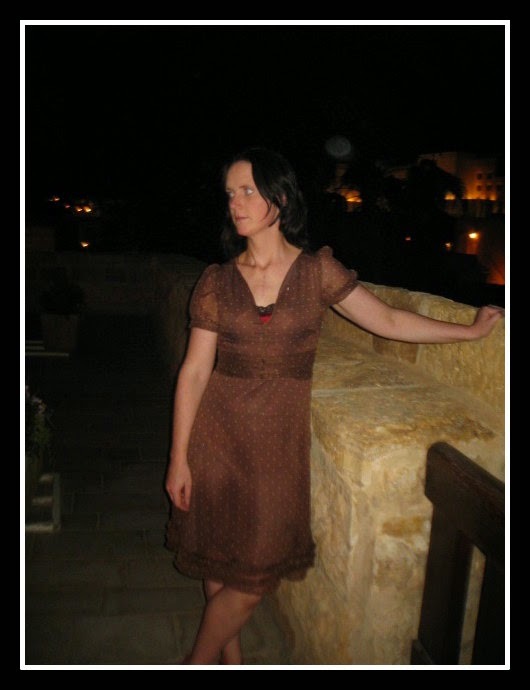 There was definitely a more relaxed atmosphere in Jordan; there were less people, less haggling, less looks. Cairo was a wonderful culture shock of intensity, but it was a nice change to be in a country where people were almost disinterested. To highlight this disinterest, our guide decided to give us Arabic names to make his life easier, Dom became ‘Sief’, I became ‘Abeer’ – he assured me that it was a popular beautiful Arabic name, nothing to do a certain alcoholic beverage. Dom thought this was great name to be used often and could only add to a happy marriage especially anytime I passed by a fridge ‘Hey, Abeer?’! The long desert highways were littered with political propaganda billboards of the late King Hussein and his eldest son and successor King Abdullah, with slogans urging young people to love and serve their country, very similar to the kind you’d see in Havana (that’s right people, I’ve got an atlas and I’m not afraid to bust that baby wide open – while I was coolin' my heels with Castro back in 06, Palin was lost in a sand dune knocking dust out of his Merrills). 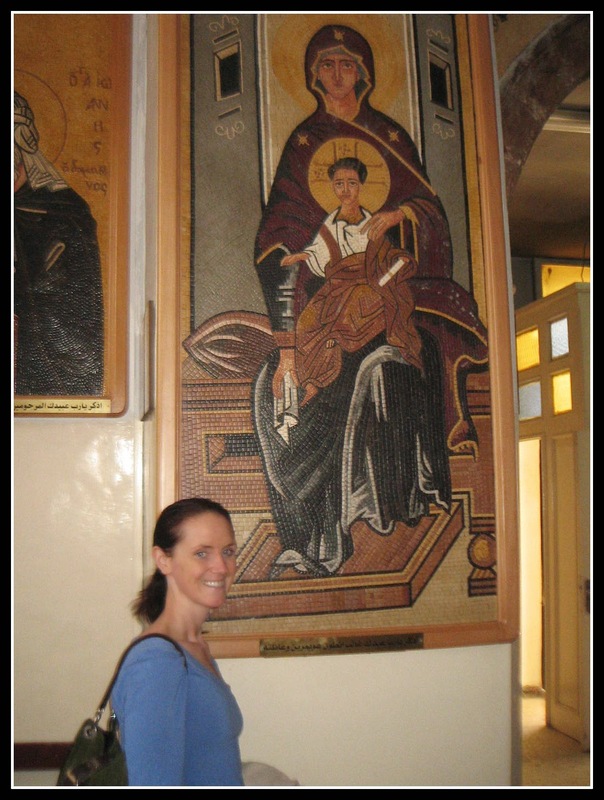 We stopped at the Greek Orthodox Church of St George in Madaba. The church contained your usual display of Christian imagery but with a Greek twist. The portrait of the Virgin Mary was not one of a beautiful pale skinned delicate flower of a young woman draped in blue, but instead she was large lady of ‘bruiser’ proportions with a dark complexion and a look of ‘don’t mess with mamma’ ferocity. The statue of Jesus was not that of a skeletal young man hanging sadly on the cross but a figure of an insolent youth with rather long eyelashes and very large ruby red lips! The church is famous for its 6th century mosaic map of the Holy Land that covers the floor of the church. The level of detail is remarkable with city walls, gates and pilgrims all picked out in bright-coloured tiles. We made a short climb to the top of Mount Nebo, where Moses first saw the Holy Land at the end of the Exodus and it’s where he reputedly died and was buried. According to legend the mountain also hides the Ark of the Covenant. It was at this point I felt a tremendous spiritual stirring and could tell in the very fibre of my bones..... I was in Indiana Jones country. We sourced some local cuisine and were a little disappointed, we had hoped for exotic spices and dangerous food that leapt off your plate and attacked your intestines, but alas everything seemed to err on the side of bland. Being Irish, I’m not saying there is anything wrong with a bit of bland food, but it was hard to keep getting excited over hummus. How much for the Holy Grail? 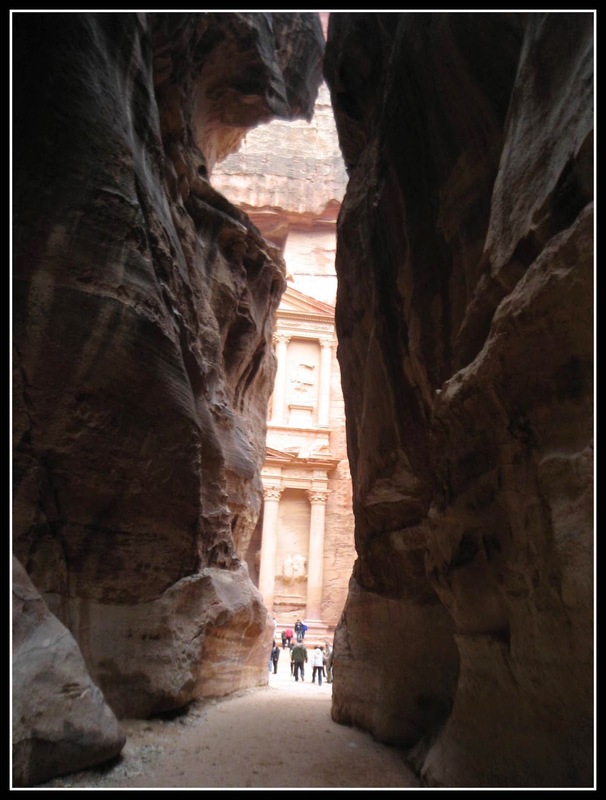 As the guide book states ‘Petra is the legendary city of the Nabatean nomadic tribe, and lies concealed behind a wall of mountains, pierced only by the Siq Canyon’. 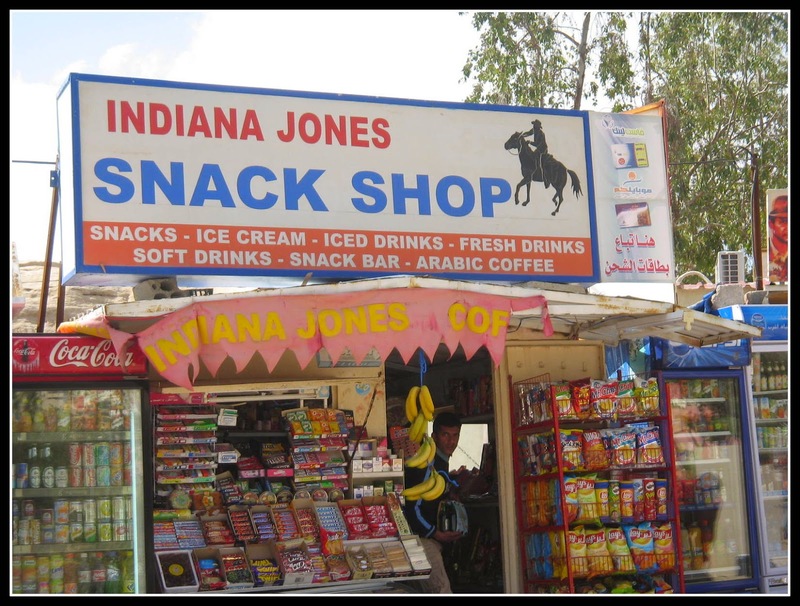 We stood outside the Indiana Jones Tuck-shop (no joke) and waited for our guide. Jordan’s answer to Columbo in an anorak rocked up, he slowly started to guide us down the narrow Siq. After much confusion about our nationality ‘No, not Holland, Ireeeeland’, his face lit up. He proceeded to tell us a humourous tale of his one experience with an Irish person. 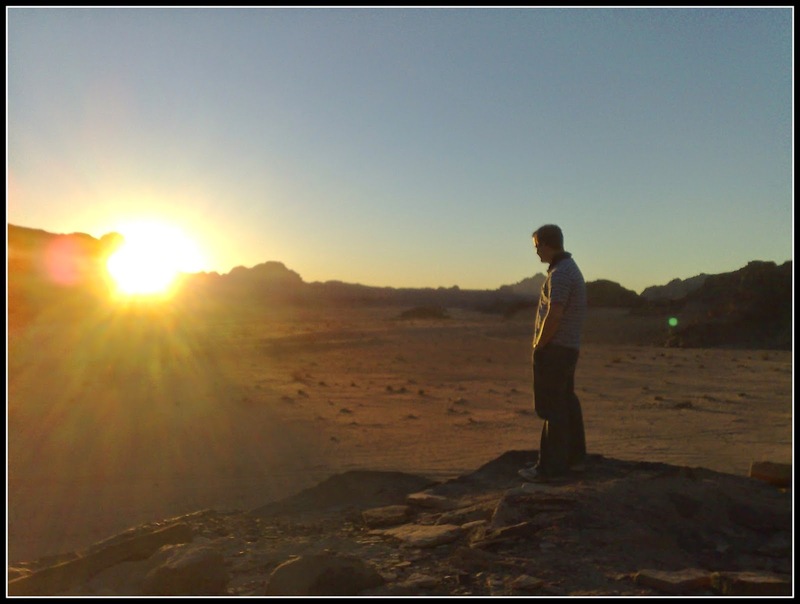 Before becoming a guide he had worked in Amman on a building site as a JCB operator. His foreman was an Irish man who liked to liberally sprinkle his sentences with profanities namely the ‘F word’. One day another Irish man appeared on the site and asked our guide where his foreman was, our guide looked about spotted his foreman but couldn’t remember how to pronounce his peculiar Irish name so he leaned out of his JCB and in his best imitation of a Cork accent yelled ‘Hey F**ker’. Sure as bedamned, his foreman turned around looking furious and our guide ran for it! He continues working on the site, all the time avoiding the foreman. As time went on our guide was due to be laid off, the Irish foreman stepped in and said he wouldn’t continue unless our guide remained and operated the JCB, our guide stayed and developed a lifelong admiration for the Irish! 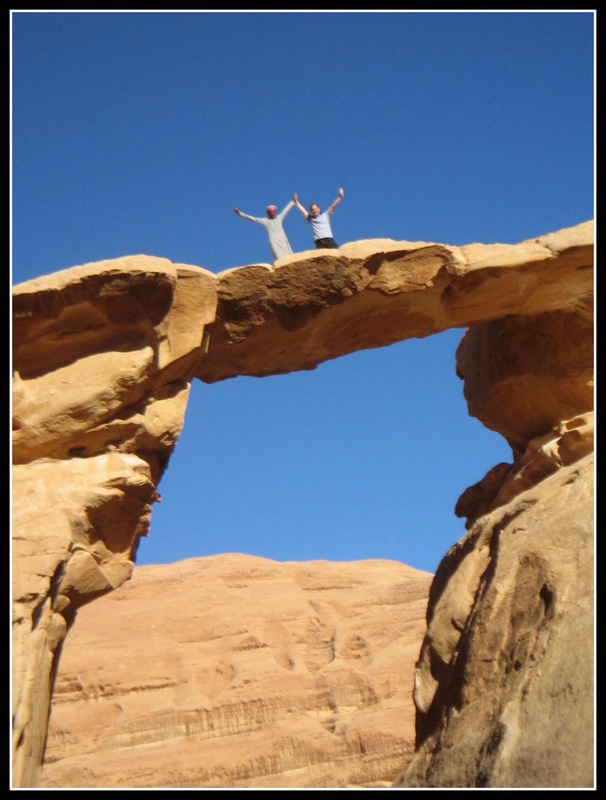 The Siq stretches for over a kilometre and in some places it is no wider than arm width. The rock colour itself is beautiful; it goes from deep reds to golden yellows with bits of blue thrown in. 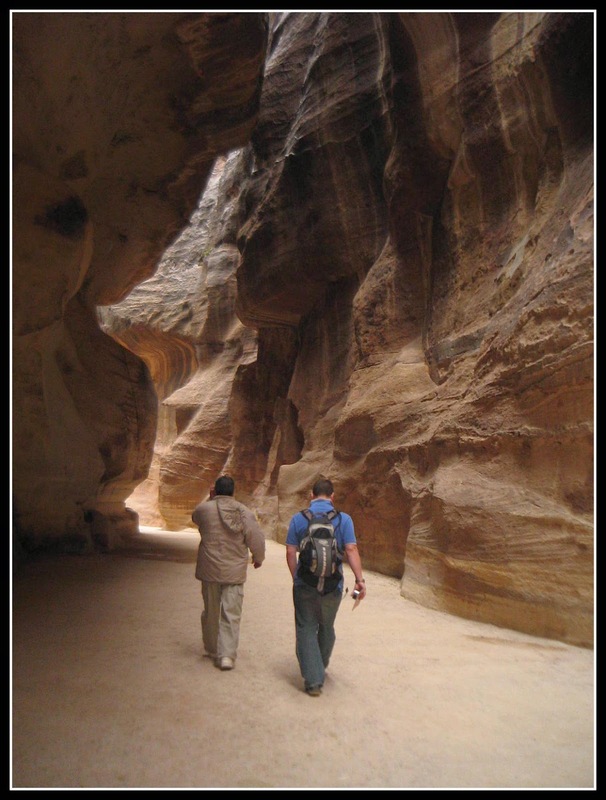 Along the way are various alters which bolster the theory that the Siq was a pilgrims canyon of worship. It’s easy to appreciate how this enclosing soaring rock face with its natural smooth shapes and colours could rival any cathedral in Europe. As we approached the end of the Siq, our guide asked us to face the wall and stare hard at it before closing our eyes. He said if we kept them closed for a minute when we opened them again we would be able to make out a wonderful image on the rocks. Like gullible goons we shut our eyes tight not even opening them as our guide made a lot of noise shuffling about with his anorak, for all we knew shoving our cameras and bags into his long pockets. Even when he turned us to face the end of the Siq urging us to keep our eyes shut as he stood behind us, it never occurred to us that he might be lifting Dom’s wallet. On his command of ‘NOW’ we opened our eyes, not to see him hot footing it down the Siq laden down with our belongings but instead smiling like a loon with the Indiana Jones theme tune blasting from his ancient mobile phone. Much to the giggles of other tourists we made our grand entrance through the last of the canyon and into Petra, Indy style. 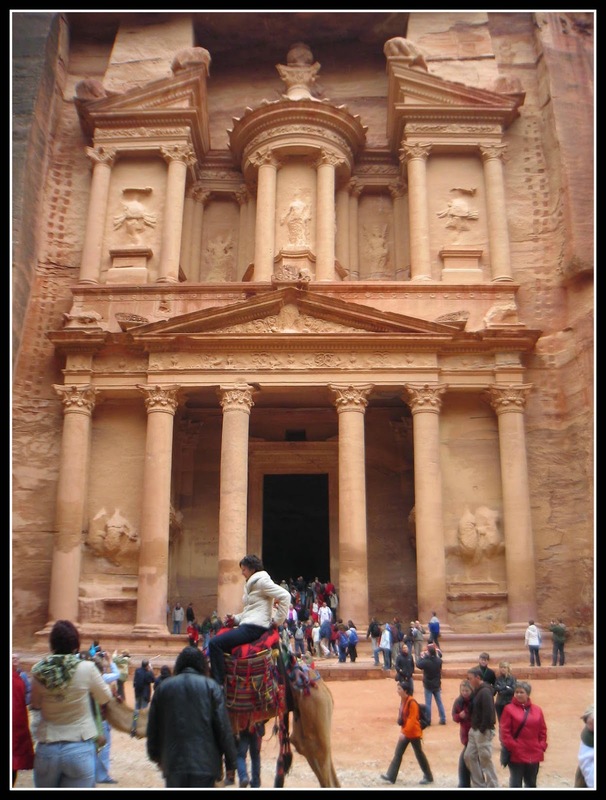 The Treasury building is the famous tomb carved into the rock face in the Rose Red City of Petra – six words ‘Indiana Jones and the Last Crusade’. It is staggeringly impressive but unfortunately not safe to enter. 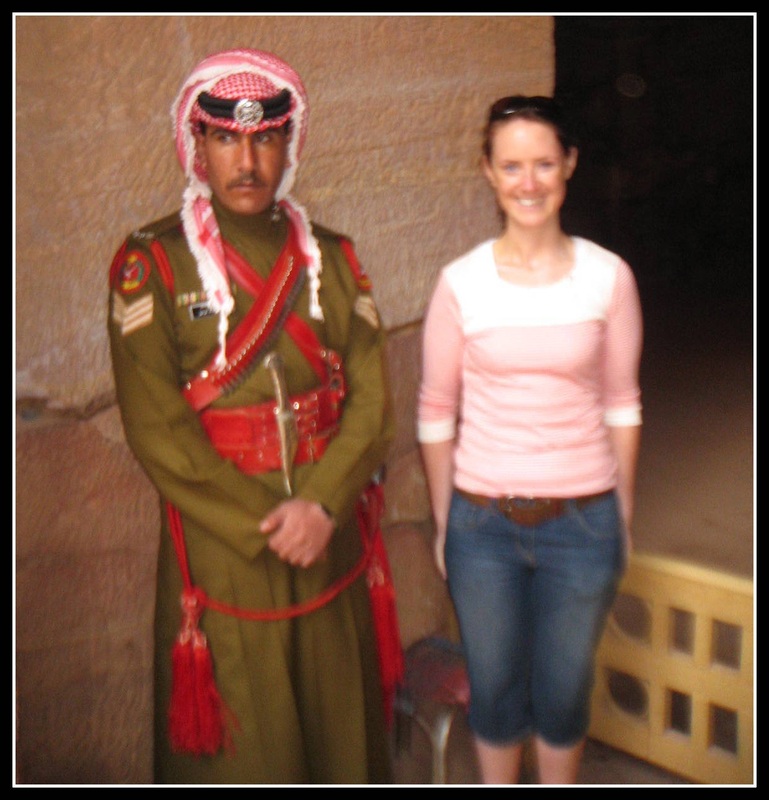 You can however stand beside the military man who guards the tomb and gawk into the blackness. The ceiling is sadly badly blackened due to the nomadic tribes that have sought refuge there over the years and lit large fires to keep warm. We climbed a hill to another large building built into the rock, while Dom and our guide sat precariously close to the precipice; I had a mild panic attack and clung to the rock face 10 feet from the edge. Our guide told us about the time Tony Blair came to visit Petra. As the story goes the authorities decided to give the place a massive cleanup and along with that a general ‘tidy up’ of the local gypsies who tend to literally hole up in the natural caves and caverns, and set up stalls amongst the tourists. For ‘project Tony’ the gypsies were herded into the large tomb at the top of the hill and told to keep very quiet during his visit. 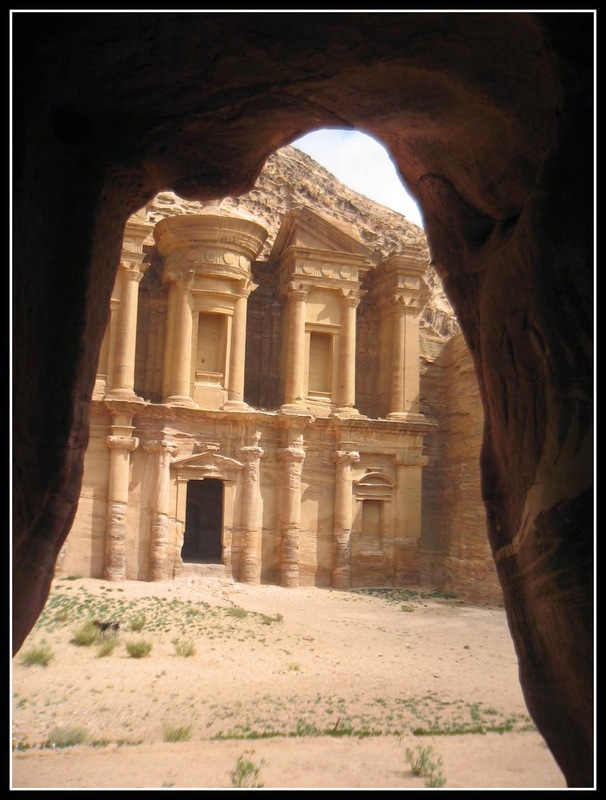 After Mr Blair completed a short tour of Petra and was being ushered back to the Siq, he enquired about the tomb on the hill and proceeded, much to the horror of the authorities, to wander off script uphill towards the tomb. You can imagine the official red faces as Tony peered into the ancient tomb only to find 100 pairs of eyes peering right back! We had to use an internet cafe one day, can’t remember why but something tells me it might have been some elaborate ruse on Dom’s part to check some sporting result. The reason I mention it is because the screen saver was a photo of the old King of Jordan watching Sadam Hussein fire an uzi submachine gun. Let’s just say we paid our dollar very promptly. We took a night walk by candlelight through the Siq to visit Petra again. People talked in low voices, it was easy to fall back in time and imagine the progress pilgrams made along this same path thousands of years ago. We spent our last day there in the Cave Bar. A lot of people walk straight past the cave, you need to look out for it, it's a hidden gem. I was mostly fascinated with it because it is a 2,000 year old tavern, TWO THOUSAND YEARS, Dude, that's old! In keeping with our honeymoon tradition we ordered cocktail for the lady, beer for the gent, and shisha pipes for all, we settled into a corner of the ancient bar (of course the pipes aren't real opium, they are apple flavoured pifflepopple nonsense, but they are deliciously exotic). 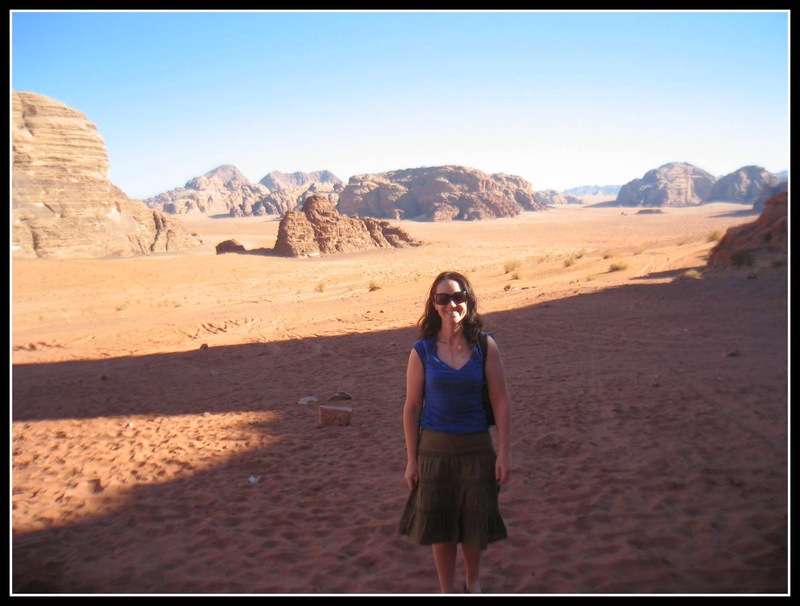 Wadi Rum is the desert and it’s where Lawrence of Arabia used to hang out his washin'. We squashed into an old school 4 wheel drive, with a guide who spoke no English but seemed to be a happy chappy. I’d never actually been to the desert before, although I’ve met some dry s****s in my time. I have to say looking out at nothing for miles but red sand and bizarre soaring rock formations (called jebels which look like smaller versions of Uluru/Ayres Rock), is indescribably calming and humbling. We drove for miles in the desert and came across a pile of rocks which once may have been a house, although where you’d go when you ran out of sugar was beyond me. 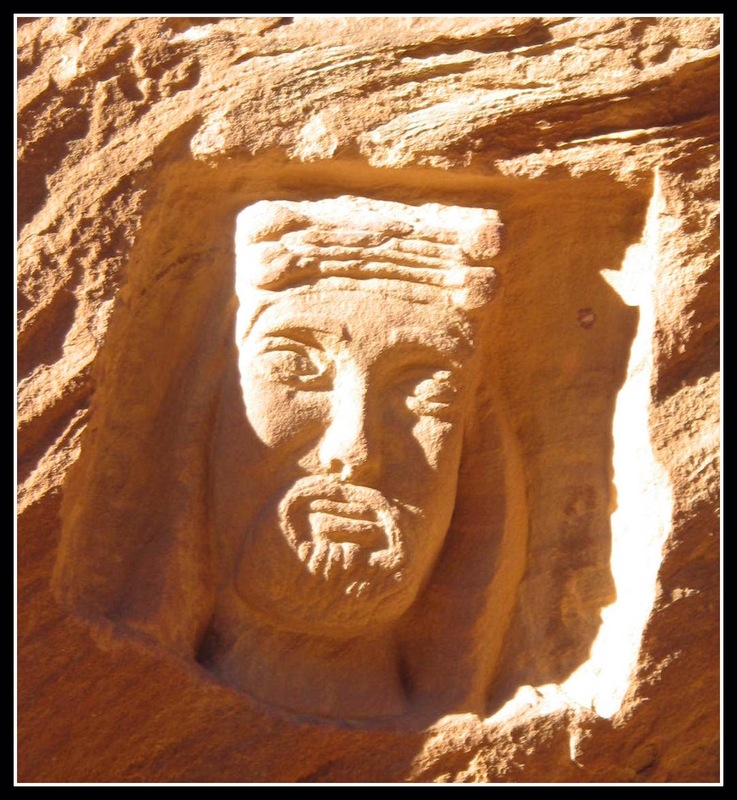 The house is allegedly Lawrence of Arabia’s house, confirmed apparently by the carving of his face in a rock nearby, hey, sometimes a postcode just doesn’t cut the mustard, the amount of times I’ve asked Dom to carve our faces into our front door, I dunno. Our guide got all enthusiastic about the 'house' and decided it would be a great idea to scrape our names onto the rocks. With the breakdown in language, mine name became Cheyla and Dom became Tony! A short drive from Larry's pad, our guide took us into a cave to show us cave paintings, and proceeded to find it hilarious as I climbed with my handbag in tow. His shouts of ‘Chelya is a city girl’ were not lost on me. Damn right I’m a city girl, I don’t care if we are in the middle of the desert, I came from the Urban Jungle of London town, no way am I leaving my handbag in the back of an unlocked car! Eyes on the back of my head my friend, mama didn’t raise no fool. Dom went off on a wander and it took ten shouts of ‘Tony’ before he returned. 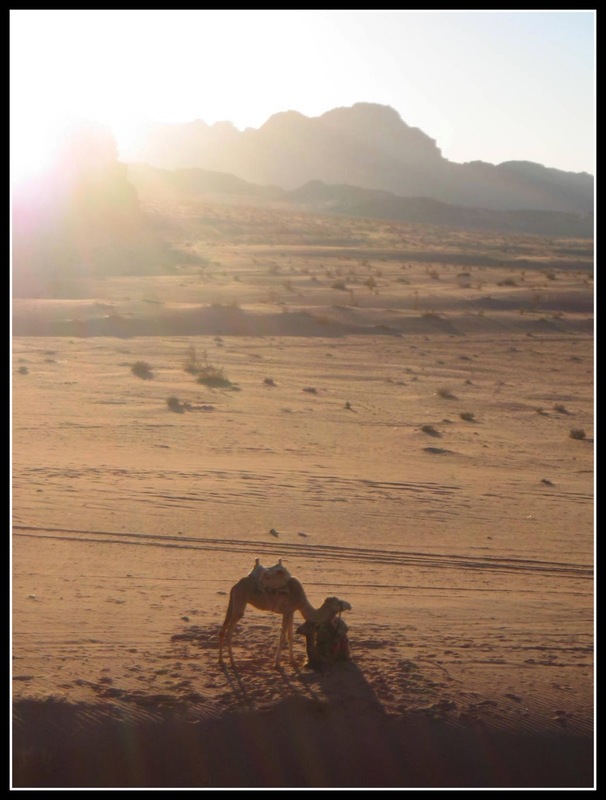 As dusk was descending our guide brought us to our desert camp where we would spend the night among the Bedouins. It was all very carefully authentic and had a touch of ‘Disney does Bedouin’ about it. There was some traditional singing around the camp fire which was perhaps an acquired taste as I found it all highly alarming. Upon discovery of my nationality there were screeches of pleasure all round, the largely drunk captain of the camp chanted "You’re IRISH, you know Mr Byrne? Ah,drink, drink, sing, sing, drink, sing" and so on. Cringing behind my cup of tea the gaggle of Canadian ladies beside us wouldn’t let it drop "Oh my God , I have never met an Irish person that can’t sing like a bird, G’wwaaaan". I sank lower in my fireside seat hoping that the Canadians were familiar with the squawk of a parakeet. I steeled my nerve thinking, no one here is a professional singer, I’ll do a quick version of Molly Malone and who knows I might wow the crowd. Meanwhile, to fill the gap, the Canadian ladies decided to do a ditty of their own. As they all giggled in preparation I looked upon them with pity, they were about to hugely embarrass themselves and then I would follow and in comparison be hailed as the supreme winner and then they’d feel even worse about themselves. Well, Holy Moley, nobody told me there was a barber shop quartet in town, they did a flawless version of Mr Sandman, which would not only get the home crowd approval with the convenient mention of the word ‘sand’ but they did an ok job, s’pose. Needless to say, parakeet tail between my legs I strolled back to our tent. At some unearthly hour Dom wrenched me from our bed to catch the sunrise, still smarting from the obnoxious Canadian display of yodeling the night before I was in the mood for some moody me time staring at the sun. I have never experienced anything remotely like it, literally absolutely NOTHING for miles, just us and the sun and the sweeping sand dunes, sensational. I was slightly on edge expecting Canadian Abba to round the corner at any minute singing ‘Take a chance on Me’ in perfect unison. Thankfully they were still in camp sleeping off their BedoVision win the night before. In Lawrence of Arabia’s words "it’s vast, echoing and God-like" (the desert, not the Canadians singing!). I didn't want to leave the desert without riding a camel, so I did. All I can think to say is that it was all a bit strange! We thought we’d end the honeymoon on a high by visiting the lowest point on earth. The Dead Sea also borders the occupied territories in Israel so as you make your way to your resort you have to pass through various military checkpoints - producing passports and smiling inanely. 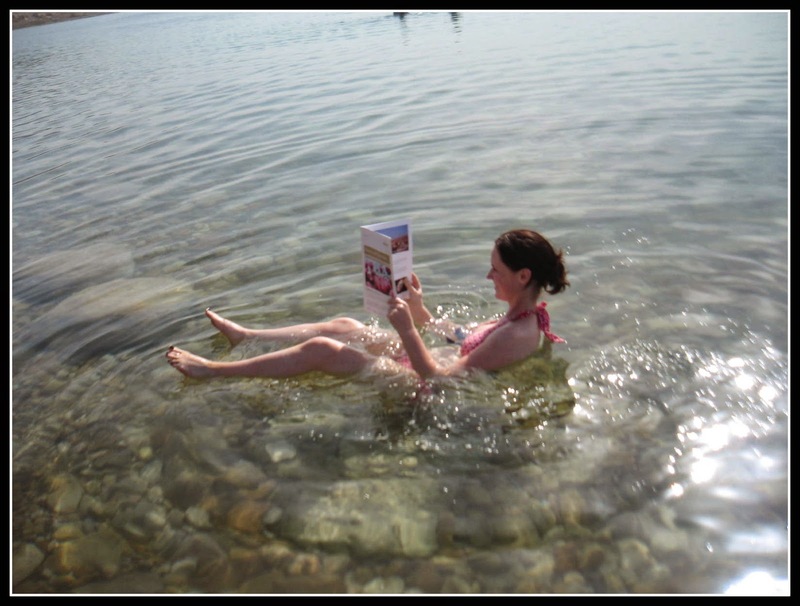 You’re no more than two minutes checked in when you’re booting it down to the sea, newspaper in hand to test if this myth of floating in this sea of salt really is true. It is! Word to the wise, try and avoid cutting yourself in the water, it stiiiiiiiiiiiiings. The muck in the sea bed is seen as a beauty product, so not to miss out, I followed my fellow tourists example and slapped the brown muck all over me. It was an interesting look. How long do I have to stand out here? We spent a lot of time chilling out at the resort, although I did manage to catch up on ‘Arabian Idol’ and yes they have a Simon Cowell equivalent. I soon tuned out when I realised it was only a matter of time before my Canadian buddies would turn up on the show. We also accidentally traipsed across a movie set. They were filming a scene where a lady belly danced for some older Arabian men in the hotel bar, not sure what everyone was looking at I dragged Dom into the room. We ended up bang smack in the line of the camera, I tried to discreetly manoeuvre us, via a clumsy line dance, past the belly lady, apologising to the camera crew as we cowboy boogied our way onto the tiny balcony half a foot wide, where we stayed for the remainder of filming. We went for dinner one night on a rooftop restaurant and I noticed that the airplanes in the distance were following a preset flight path (Orville Wright has nothin on me!). I determined that we must have been overlooking Israel and the planes were patrolling the West Bank. I asked our waiter were we looking at Israel he said sharply "No, that is Palestine". I guess I could tell what political side of the bed he got out of. An interesting moment and a lesson learned.